The PAK-FA ( Russian : Perspektivny Aviatsionny Kompleks Frontovoy Aviatsii, literally "Prospective Airborne Complex of Frontline Aviation") is Russia's next generation multi-role stealth fighter. It is designed by the Sukhoi Design Bureau, the same company that also produced the extremely successful Su-27 / Su-30 / Su-35 Flanker family of aircraft. The prototype is given the designation T-50, but the final production type will likely have a different designation, perhaps Su-50. Already, some websites have nick named it the Firefox. Its early developmental history is not well documented in open sources due to the extreme secrecy common in military projects of this nature. The Soviets probably conceptualized the need for a fifth generation fighter around the time of the initial deployment of its fourth generation predecessor, the Su-27 Flanker, in the early 1980s. However, the end of the Cold War and the collapse of the Soviet Union meant that the early efforts were fraught with difficulties and delays. 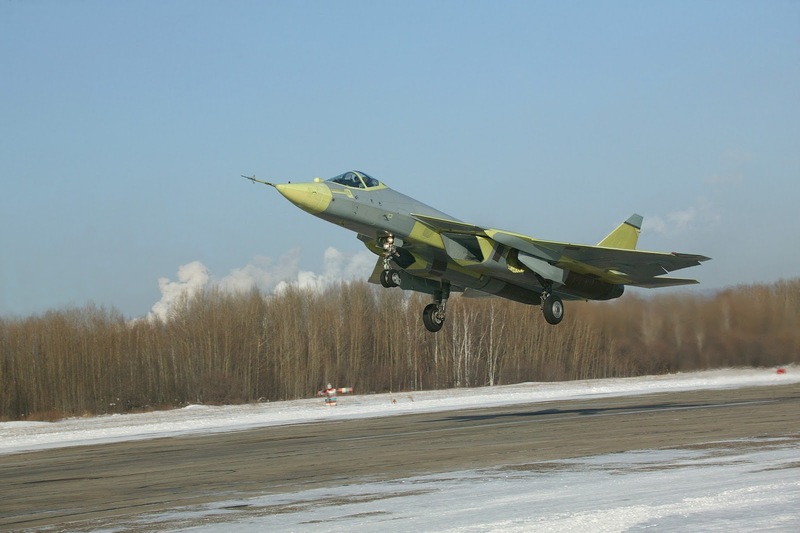 Even designs in the early flight testing stage like the Mikoyan Project 1.44 MFI ( Multirole Frontline Fighter ) programme were eventually cancelled due to costs overruns. 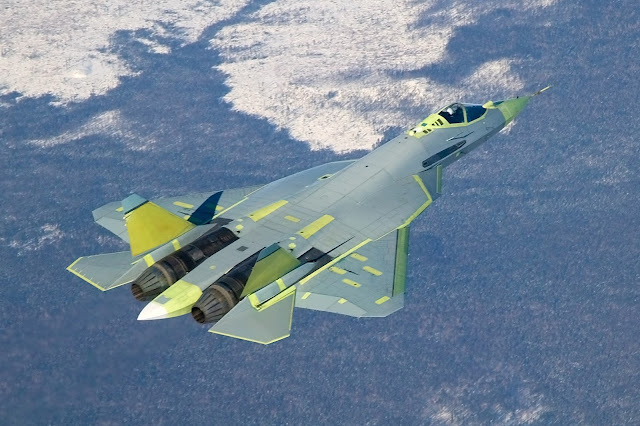 A new next-generation fighter project, the PAK-FA, was subsequently initiated. A competition took place in 2001 between the design houses of Sukhoi, Yakovlev and Mikoyan where Sukhoi emerged victorious and was chosen to lead the design of the new aircraft. 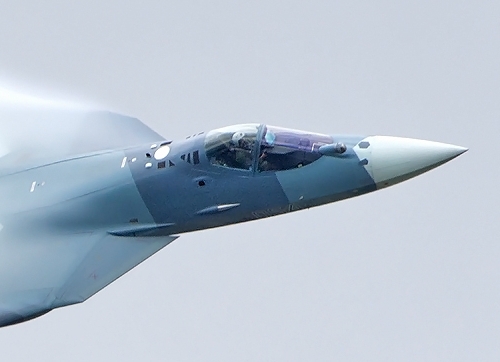 After more competitions in 2003, various Russian institutes with long and unpronounceable names were selected to develop the PAK-FA's avionics suite. NPO Saturn would be the lead contractor for the engines. The Novosibirsk Aircraft Production Association ( NAPO ) and Komsomolsk-on-Amur Aircraft Production Association ( KnAAPO ) were both appointed the aircraft manufacturers. See what I mean? 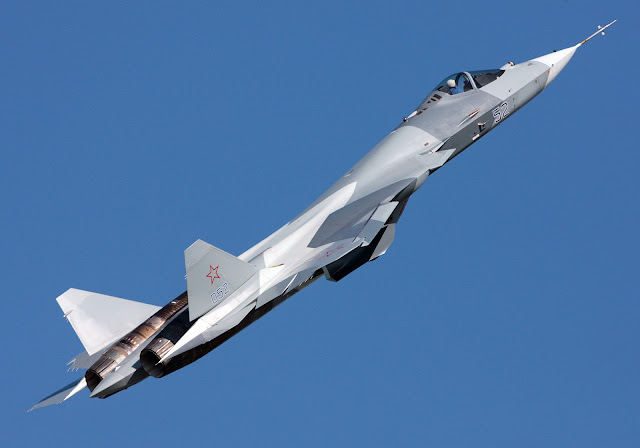 By 2007, Russian news agencies reported that the PAK-FA programme's developmental phase had concluded and the construction of the first prototype for flight testing would begin. That same year, Russia and India agreed to co-operate and jointly develop India's fifth generation fighter aircraft project ( FGFA ) which will largely be based on the PAK-FA design but adapted for the unique needs of the Indian Air Force. After repeated delays due to unspecified technical issues, the PAK-FA's maiden flight finally took place on 29th Jan 2010. From an initial single prototype, the Russian test fleet now has five and there are plans to build another four before the end of 2015. Initial production has been targeted for 2016 and a total of twelve aircrafts will be built for the Russian Air Force for a start. The emergence of the PAK-FA is significant as it draws to an end the more than three decade long American monopoly on the design of stealth or Very Low Observable ( VLO ) aircraft. Beginning even before the first flight of the Lockheed F-117A Night Hawk stealth attack fighter in 1981, America had lead and dominated the field of stealth design and technology. The F-117A became operational in 1983 and had a distinguished combat history during the First Gulf War in 1991, vindicating the billions of dollars spent in acquiring this new technology. By 1997, the USAF added to its ranks the Northrop Grumman B-2 Spirit stealth bomber followed by the fielding of the Lockheed Martin F-22A Raptor stealth fighter in 2005. The latest US-lead multi-national effort to produce the next generation stealth fighter is the ongoing Joint Strike Fighter ( JSF ) programme, a.k.a. the Lockheed Martin F-35 Lightning II. Slowly but surely, stealth technology had become a must have for anyone who can afford it. Apart from Russia, China has also been aggressively researching on stealth aircraft and has two different stealth fighters currently being flight tested, the Chengdu J-20 and the Shenyang J-31. Japan has its own stealth fighter programme in the form of the Mitsubishi ATD-X ( Advanced Technology Demonstrator - X ) due for flight testing this year. So does South Korea, who's Korean Aerospace Industries is developing the somewhat stealthy next generation fighter the KF-X. Stealth technology refers to the application of scientific principles and techniques to render an object less detectable by an observer. The key word here is less detectable, not invisible, as many a lay person might mistakenly think. When designing aircrafts, aeronautical engineers are particularly concerned with the visibility of the aircraft in the radio frequency segment of the electromagnetic spectrum, that is to say, the detection by radar. 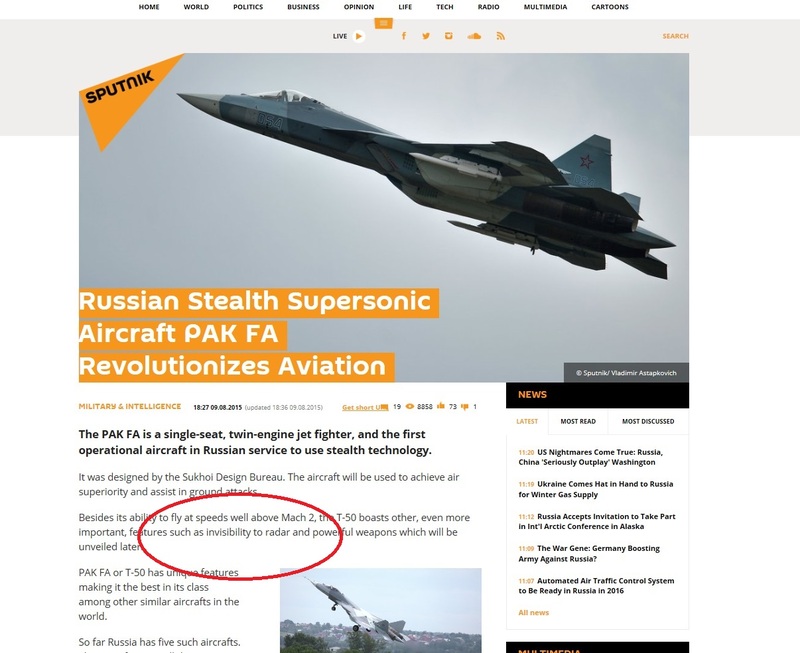 It is a fallacy to state that stealth fighters are invisible to radar as this article by Sputnik News Agency did. There are of course other ways that an aircraft can be detected, especially if it is in fairly close proximity to the observer, like the Mark I human eyeball utilising the visible light spectrum, perhaps enhanced by optical aids like binoculars. Heat produced by the aircraft's engines and heat generated by the fuselage due to air resistance can be detectable by thermal sensors. Last but not least, the sound of the jet engines can also give away the presence of an aircraft. However, the use of radar remains the most practical and efficient way of detecting aircrafts, especially the non-stealthy variety, at long range. To reduce the radar signature of an aircraft, the designers will shape the airframe such that incoming radar waves can be scattered away from the direction of the transmitting device thereby reducing the intensity of the returning / reflected pulse. They can also use composites to replace some of the metallic surfaces of the aircraft and that too helps. Finally, coating the reflecting surfaces with radar absorbing material ( RAM ) is another essential technique used by the engineers. 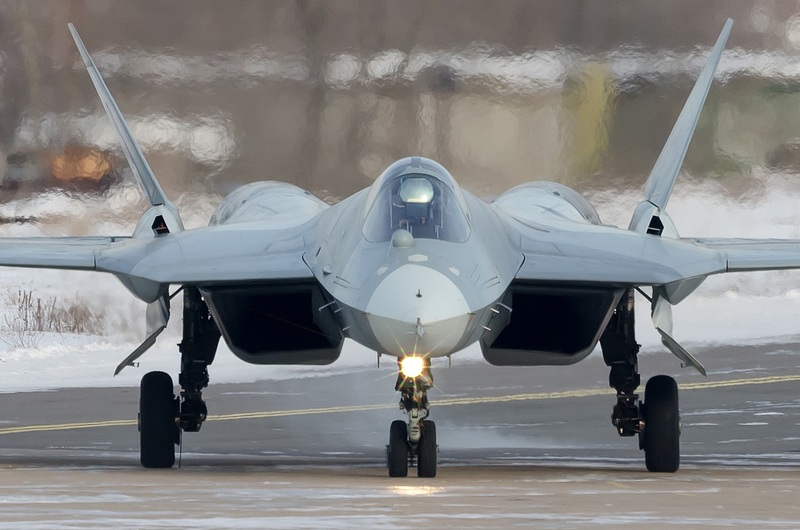 The PAK-FA is a single seat, twin-engine multi-role stealth fighter with a design that is so advance that when operational, will likely render all NATO 4th generation legacy fighters and even the F-35 Joint Strike Fighter ( JSF ) obsolete and irrelevant. 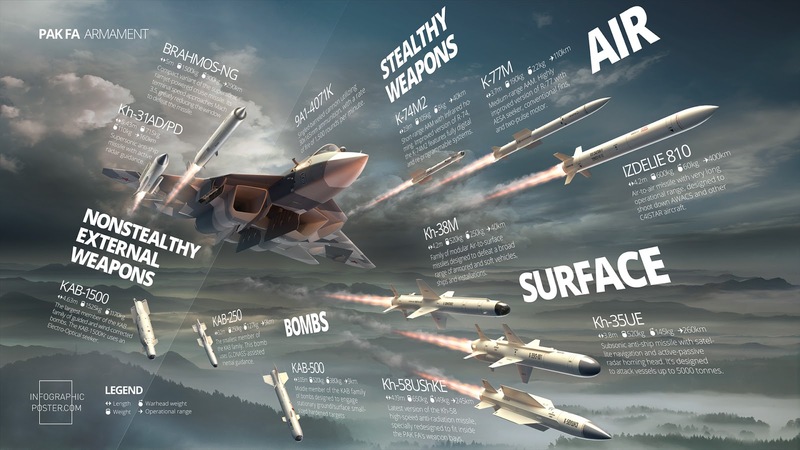 Only the F-22A Raptor stands a remote chance of achieving parity with the PAK-FA in beyond-visual-range ( BVR ) and within-visual-range ( WVR ) air combat. Like the F-22, the PAK-FA carries with it all the hallmarks of a fifth generation fighter, namely stealth, supersonic cruise, thrust vectoring, highly integrated avionics and a powerful suite of active and passive sensors. Add to that unmatched agility, class-leading combat endurance, short take-off and landing ( STOL ) capability, all lacking in the F-22, and you can easily understand why the PAK-FA is such a badass. The ignorant might have dubbed it the Raptor-ski or the F-22-ski but the PAK-FA is not an imitation copy of the F-22. The era where Soviet / Russian technology lags behind those of the West by one to two decades is largely over. Nowadays it is more likely the West is trying desperately to keep up with Russian innovations. Let's examine these 5th generation attributes one by one. The PAK-FA is thought to have an all-aspect RCS of 0.01m² or -20dBsm. These are merely analytical estimates based on publicly available images of the prototype which may differ from the final production version. It is also worth noting that the prototypes may not necessary have the full VLO treatment like RAM coatings which is not needed when performing non-stealth related tests like weapons integration and may lead to falsely optimistic conclusions by Western defense analysts. 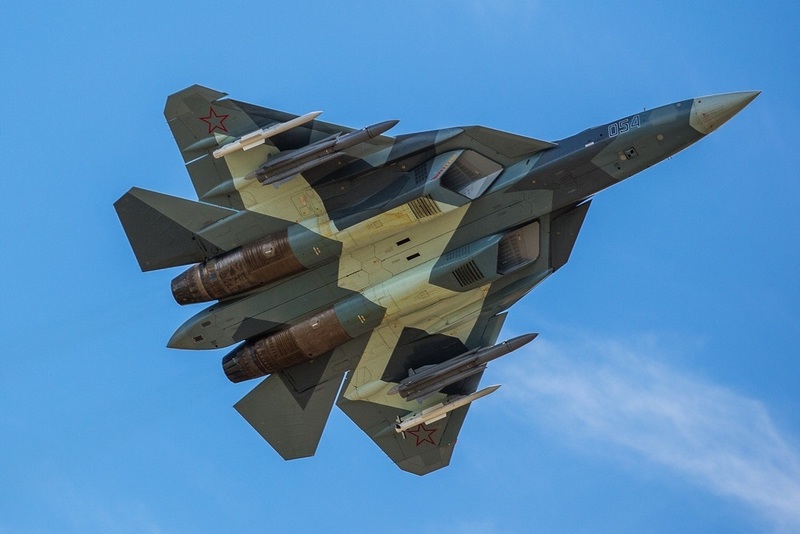 It would seem at first glance that the PAK-FA is less stealthy compared with the F-22 and the F-35 but in reality, the Russian designers gave up some stealth in exchange for aerodynamic agility. At -20dBsm, the PAK-FA is still several magnitudes more stealthy than legacy 4th and 4++ generation fighters like the Rafale or the US Teen-series fighters. It will probably be stealthy enough to delay detection by advanced AESA radars like the F-22's APG-77 until the enemy fighter is within its BVR missile range. Also, unlike the F-35 where the -30dBsm RCS holds true only for the frontal aspect ( the rear and profile RCS is much higher due to less radar shielding to save costs ), the RCS of the PAK-FA is more or les the same when viewed from all angles ( all-aspect ). So less stealthy than the F-22 but enough to pose a tough challenge for its opponents. Supersonic cruise ( sometimes called supercruise ) refers to the ability of an aircraft to sustain supersonic speeds for long durations without the need to engage its afterburners. Afterburners can increase the jet engine's power output tremendously but at the expense of huge fuel consumption and an increase in infra-red signature. The ability to supercruise meant ingress and egress from the area of operation can be achieved in a shorter time. Supercruise can also extend the maximum range of guided and unguided munitions and missiles by virtue of a higher initial velocity when released from the aircraft. Finally, supercruising allows the aircraft to launch ramjet powered missiles without the need for a powerful booster to first bring the missile to supersonic speeds for the ignition of the ramjet engine, making the missile launch stealthier, less detectable by the enemy's IRST. The PAK-FA prototypes currently on flight tests are capable of supersonic cruise thanks to their NPO Saturn AL-41F1S ( a.k.a. Al-31F 117S ) afterburning turbofan engines with variable axisymmetric vectoring nozzles which also powers the Sukhoi Su-35S advanced Flanker. Each is capable of producing 8800 kgf of dry thrust and 14000 kgf of full afterburning thrust. Engine life is rated at 4000 hours. This engine is just a reduced risk, interim solution for the PAK-FA while an even more advanced and powerful engine is being developed. Reports have indicated that a Mach 1.5 or higher sustained speed is possible. 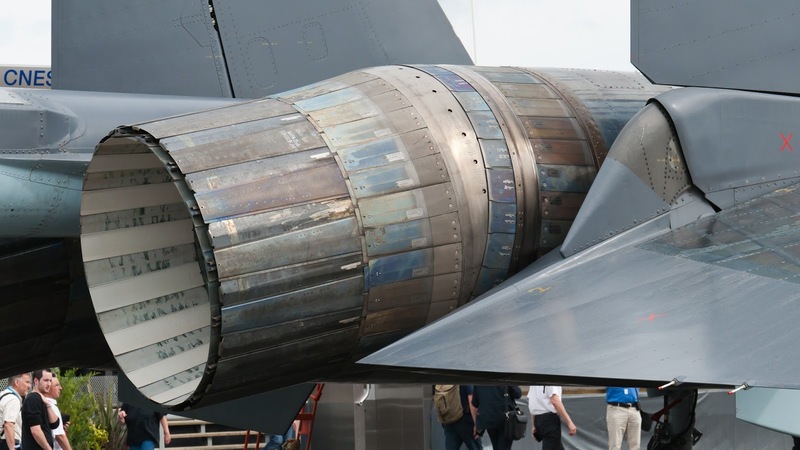 Thrust vectoring or thrust vector control ( TVC ), is the ability of an aircraft or missile to manipulate the direction of the thrust from its engine or motor to effect a change in its flight path. This can be achieved by means of a steerable nozzle or a movable vane. The AL-31F 117S engine has a TVC capability of ±15° in the vertical plane and ±8° in the horizontal plane at a rate of 60°/sec. By combining the vertical and horizontal nozzle movements, the pitch, yaw and roll of the aircraft can be influenced and thus the PAK-FA is said to have 3D TVC. Thrust vectoring is obviously a great advantage in dog fights as it allows the fighter to turn faster and tighter, contributing towards better agility and maneuverability, both important attributes for survival. For aircraft on stealth penetration missions, another advantage is that 3D TVC can be used for primary pitch, yaw and roll control, in essence bypassing the conventional flight controls that require movements of the aerodynamic control surfaces like ailerons. This will ensure that the low RCS of the stealth aircraft is not compromised by movements of the control surfaces. The PAK-FA has a digital glass cockpit similar to the layout in the Su-35S comprising of two large 38cm multifunctional LCD displays and three smaller control panel displays. The cockpit has a wide angle Head-Up Display ( HUD ) and the pilot wears a new NSTsI-V helmet mounted sight and display for the ZSh-10 helmet. Helmet mounted sights ( HMS ) allow for a rapid means to cue late generation heat seeking missiles with high off-boresight capabilities to achieve missile lock and missile firing with just the look from the pilot's eyes. They can also display flight information on the inside of the helmet visor so that the data is always in view, no matter where the head is turned towards. The primary controls are a joystick and a couple of throttles, inevitably with Hands On Throttle-And -Stick ( HOTAS ) infusion which together with HUD and HMS help to increase the pilot's all important situational awareness by reducing the need to look at the cockpit panel displays. The aircraft has a fully digitalized quadruple redundant advanced flight control system which together with the 3D thrust vectoring engines and all moving vertical and horizontal stabilisers allow for extreme agility. 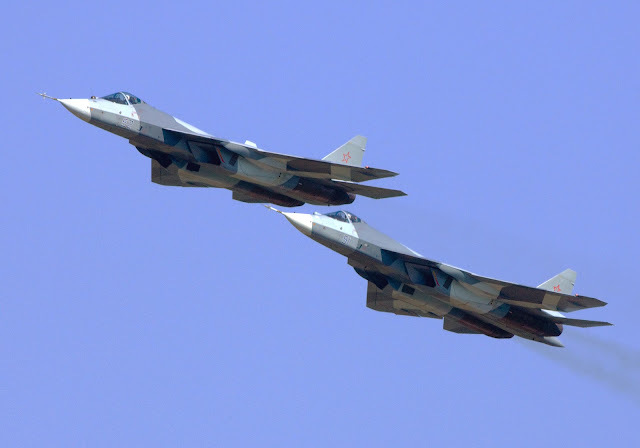 The issue of datalinks is harder to tackle as there is not much revealed on the PAK-FA's bi-directional data transfer capabilities, the datalink terminals themselves, as well as the frequencies involved. It is nonetheless an important component in today's network centric warfare and the Russian designers already have an equivalent to NATO's JTIDS/MIDS Link 16 in the form of the TKS-2 datalink system of the Su-30MKK. The PAK-FA should have something similar if not better. So far, it is known to be equipped with the Polyot S111-N secure communications system. The PAK-FA also carries the upgraded KRET BINS-SP2M inertial navigation system, that autonomously processes navigation and flight information, determines position and motion parameters in the absence of satellite navigation, and can integrate with GLONASS, Russia’s space-based satellite navigation system. The PAK-FA has a plethora of advanced active and passive sensors. If a fighter can only be as good as its radar, the PAK-FA has five. The main radar being nose mounted, two more cheek mounted ( forward fuselage ) side looking radars and two more at the leading edge extensions ( LEX ) of each wing. Collectively, they are known as the N036 Byelka radar system developed by the Tikhomirov Scientific Research Institute of Instrument Design ( NIIP ). 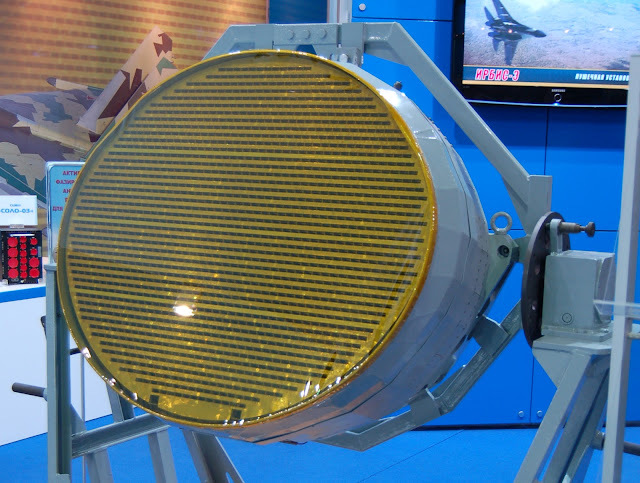 The N036 radar is an integral part of the PAK-FA's Sh121 multifunctional integrated radio electronic system ( MIRES ) comprising of not only the several fore mentioned radars in different wave bands, but also an identification system ( IFF ), secure communications, electronic warfare ( EW ) and electronic intelligence ( ELINT ) components. The main radar is the N036-1-01 active electronically scanned array ( AESA ) radar with more than 1500 transmitter/receiver ( T/R ) modules. It is a multimode radar for both air and surface targets that operates in the X-Band. The maximum detection range for this radar is said to be 400km. It can track up to 60 targets simultaneously and engage up to 16 at the same time. The two side mounted secondary X-Band AESA radars are designated N036B-1-01 and have 358 T/R modules each. They are angled at a downward 15 degrees angle and is primarily for ground observation. These lateral arrays also augment the main forward looking radar by widening the angle of search. The most interesting would be the two wing mounted L-Band AESA radars designated N036L-1-01 which is unlike anything that the West has. The L-Band occupies the 1.0GHz to 2.0GHz region of the radio spectrum corresponding to wave lengths of between 15cm to 30cm. It is of a significantly lower frequency and therefore longer wavelengths compared with the X-Band which straddles the 8.0GHz to 12.0GHz region and have wavelengths between 2.5cm to 3.75cm. The L-Band is also a very congested band utilized by both military and civilian applications. For example, GPS and Glosnass navigation systems, military identification friend or foe ( IFF ) and its civilian analogue the secondary surveillance radar ( SSR ) systems, aircraft Automatic Dependent Surveillance-Broadcast ( ADS-B ), NATO's JTIDS/MIDS/Link-16 information distribution systems, GSM phones and radio astronomy. Add to that ground based long range search radars and airborne AWACS/AEW radars like the Israeli IAI / Elta EL/W-2085 multiband AESA used in the G550 ... you get the picture. 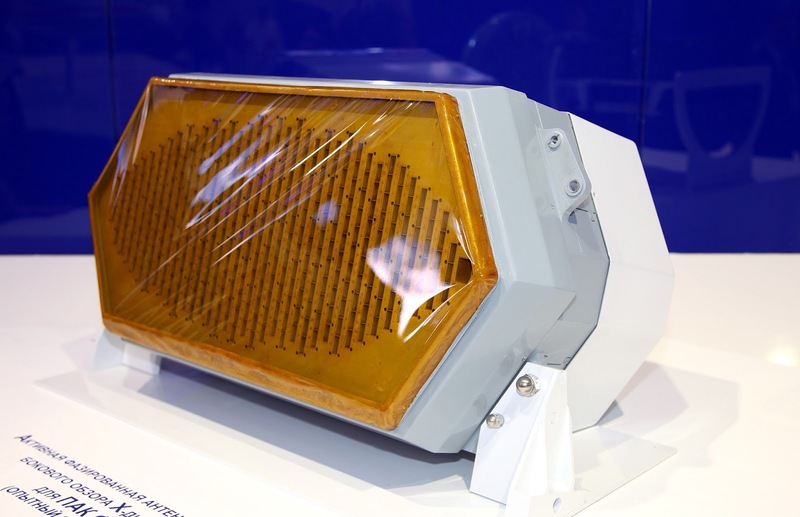 When fully functional and mature, this L-Band AESA radar has the potential to be a game changer in aerial warfare. Firstly it stands a better chance of detecting fighter-sized stealth aircraft compared with its X-Band counterparts as most low observable aircrafts have designs optimized for stealthiness in the X-Band. Many stealth shaping features such as jagged exhaust nozzles, faceted surfaces and specially shaped engine inlets become ineffective in the controlled scattering of incoming radar waves when their size approximates the wavelength of the inbound pulse. So a L-Band radar might just pick up a faint signature where the X-Band sees nothing. Larger VLO aircrafts like the B-2 bomber are more or less immune as they have structures larger than the typical 15cm to 30cm wavelength of the L-Band waves. At the same time the L-Band radar may also have a secondary function as a IFF transponder since the process utilizes a similar frequency band, thus reducing weight, volume and cooling requirements by saving on antennae and T/R module numbers. Thirdly, since the L-Band is utilized by so many applications, the L-Band radar may also be used to passively track and locate L-Band radar emissions from AWACS/AEW airborne radars, ground based search radars, emissions from JITDS/MIDS/Link-16 and hostile IFF / SSR emissions at long range. 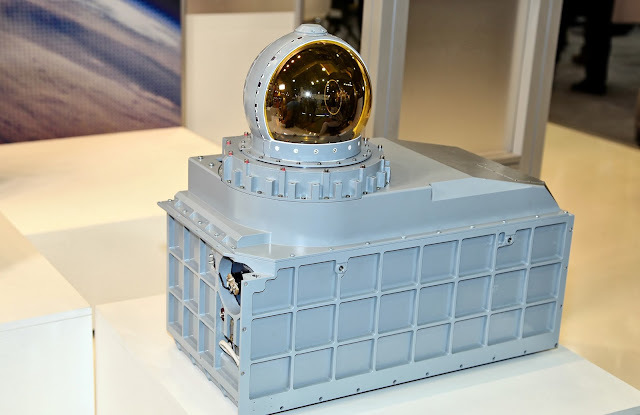 It can then be used to execute high powered active jamming on those individual L-Band sources, an electronic attack to blind hostile AWACS radars and sever command and communications datalinks. Broad area jamming of GPS / satnav receivers may also be possible rendering navigation more difficult for hostile forces and the accurate delivery of GPS guided munitions to those jammed areas quite impossible. Also part of the Sh121 MIRES would be the KNIRTI L402 Himalaya electronic countermeasures ( ECM ) suite which uses the Byelka radar's arrays and its own arrays to detect, jam and defeat radiofrequency systems. One L402 is known to be mounted in the dorsal sting between the two engines. If you think the MIRES is too much to handle, the PAK-FA has more up its sleeves. It will also be equipped with the 101KS Atoll Electro-Optical Integrated System which includes the 101KS-V Infra-red Search and Track System ( IRST ) mounted in front of the cockpit, the 101KS-N Targeting Pod mounted on the underside of the engine air intake, the 101KS-U ultra-violet sensitive Missile Approach Warning System ( MAWS ), and the 101KS-O Directional Infra-red Counter Measures ( DIRCM ) turret mounted on the upper fuselage. The 101KS-V Infra-red Search And Track System ( IRST ) is designed to detect heat emissions from aircraft and missiles passively. IRST are essentially thermographic cameras that detect and track heat sources without emitting any radiation in the process ( passive ). 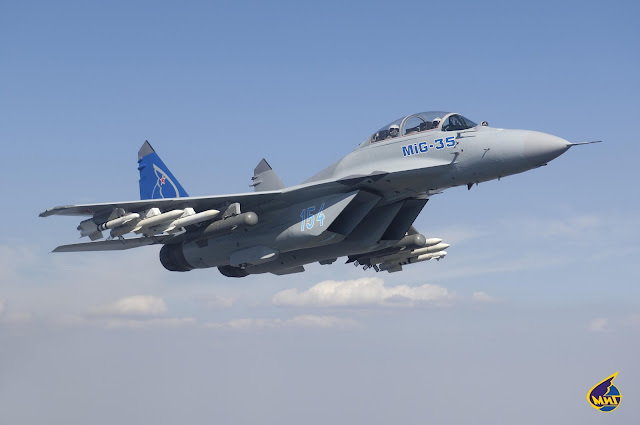 Older generation IRST systems have been an integral part of all Russian 4th and 4++ generation fighters like the MiG-29 Fulcrum and the Su-35 Flanker as well as the Euro-canards like the Rafale and the Typhoon. The 101KS-V is also sometimes referred to as the OLS-50M which is an advanced IRST based on the revolutionary Quantum Well Imaging Photodetectors ( QWIP ) technology. These new generation IRST systems have the potential to operate in a much wider spectral bandwidth that includes the very longwave 15 micron band to detect very cool targets. They can also be made to operate simultaneously in several different bandwidths. An IRST device mounted in front of the canopy on the starboard side of a PAK-FA prototype in a photo dated Sep 2013. The final production version may look different with stealth shaping and faceting. Frontal view of the PAK-FA with the ball-like IRST in front of the cockpit Feb 2014. Photo credit Roman Tregubov. IRST may be the only effective means of detecting VLO aircrafts like the F-22 at long range since they are by virtue of their stealth, not highly visible on radars. All air frames, even stealthy designs, generate heat from air-resistance when the aircraft flies. The aircraft's engines also produce huge amounts of infra-red signature. In addition, IRST can also act as an early missile launch warning by detecting the heat from the enemy fighter's BVR missile launch. The 101KS-N is an advanced navigation and targeting system similar in function to the AN/AAQ28 Litening and AN/AAQ33 Sniper advanced targeting pods of the US military. 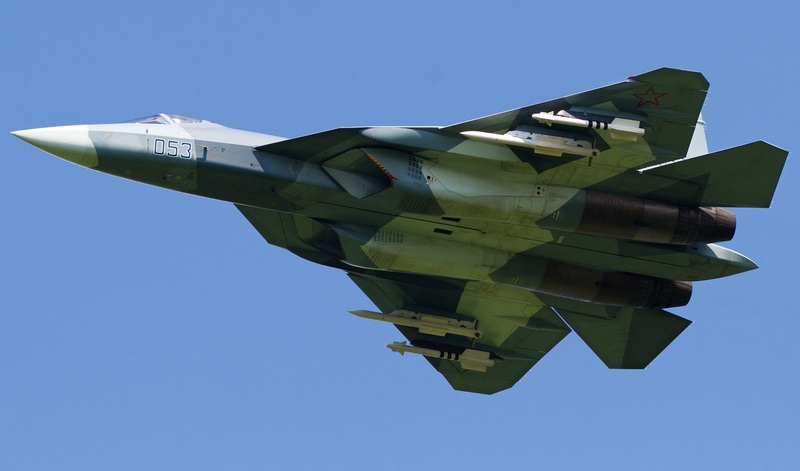 To minimize the PAK-FA's RCS it would be integrated into the airframe and would not be hanging as an external pod like the Litening or Sniper ATP on a F-16. It gives the PAK-FA precision ground attack capabilities in all weather, day or night. The 101KS-U is a missile approach warning system against infra-red homing missiles. MAWS using ultraviolet technology can operate under all weather conditions and will not be affected by solar clutter. They provide good directional information of the incoming missile for good decoy dispensing decision making, maneuvering and to cue the DIRCM system into action. 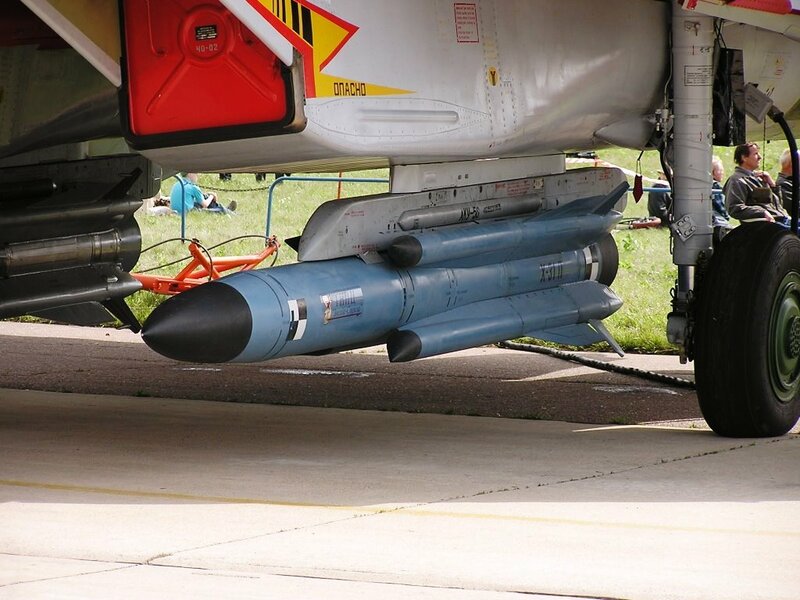 DIRCM systems like the PAK-FA's 101KS-O work by directing a beam of energy towards the incoming heat seeking missile to confuse or destroy its tracking mechanism. In this case the directed energy takes the form of a laser beam. The 101KS-O turrets are located on the dorsal spine and the forward fuselage. So in essence, the PAK-FA is overflowing with all sorts of sensors spanning a huge swathe of the electro-magnetic spectrum. Don't be surprised if the L-Band AESA radar could eves drop on your GSM phone signals too! The PAK-FA's aerodynamic design is an evolution from the already agile Su-27/30/35 Flanker family of aircraft characterized by large wing areas and large control surfaces. This, combined with 3D thrust vectoring and an integrated digital flight control system and a powerful engine gives the PAK-FA unmatched maneuverability. The aircraft could recover from a controlled stall with ease, as demonstrated in may aerial displays. It could do crazy turns, even flat turns are possible. During air combat maneuvers, turning without banking would minimize the exposure of the usually problematic / unstealthy underfuselage to the enemy fighter. Extreme agility may also allow the PAK-FA to achieve a kinematic defeat of incoming BVR missiles which may lack the ability to pull high terminal g ( meaning to turn tightly enough ) to home in for the kill. This will degrade the missile's probability of kill ( Pk ), requiring more missiles to be expanded to score a kill. Although stealth fighters are optimized to fight stand-off battles with long range sensors and weapons, there may still be occasions when the BVR missiles have been exhausted or when the rules of engagement requires positive identification at WVR distances. When the fight gets close and dirty, that's when agility may mean the difference between survival or death. The PAK-FA has been designed right from the start with STOL capabilities in mind. Ability to take-off or land on short airstrips is obviously an important tactical advantage, allowing the aircraft to use shorter, less conventional or even improvised runways like highways. STOL is also very important if you intend to have carrier based operations on platforms like the ski-jump equipped Admiral Kuznetsov. In fact, the PAK-FA has a robust undercarriage more akin to those of carrier-borne naval aircrafts. All it lacks is an arrestor hook. It would not be surprising if a navalised version, complete with folding wings, were to appear in the near future as a replacement for the Russian Navy's Mig-29K and Su-33. The PAK-FA has a huge internal fuel capacity of something like 10000kg or 22700lbs. If you consider its fully loaded weight to be 29270kg as indicated by wikipaedia, it will yield a fuel fraction of 0.35, a respectable figure in line with an aircraft with supercruising capabilities. It gives the aircraft a maximum range of 3500km at subsonic speeds with internal fuel alone. With aerial refueling, the ferry range is extended to 5500km. Now, with all the important aircraft attributes discussed, we can examine the internal weapons bay and the assortment of air-to-air and air-to-surface weapons that the PAK-FA was designed to carry. In order to maintain stealth when carrying ordnance, the PAK-FA has two large main internal weapon bays arranged in tandem in the underfuselage measuring 4.6m long and 1.0m wide. It has another two smaller secondary weapon bays located at the wing root area lateral to the engine inlets. The main internal bays can carry a total of eight air-to-air missiles (AAM ) or multitudes of air-to-surface weapons weighing up to 700kg or 1500lbs each. The secondary weapons bay are intended to carry one short range heat seeking missile each. Carrying all weapons internally preserves the aircraft's low RCS as well as the aerodynamic efficiency of the airframe, which translates to longer range, higher speeds and tighter turns. For missions that do not require stealth, six external hardpoints are available for the attachment of heavy cruise missiles, bombs, AAMs and external fuel tanks. beautifully illustrated in this infographic by Anton Egorov. The K-77M is an improved version of the highly successful R-77 BVRAAM ( NATO reporting name AA-12 Adder ). It has a dual-pulse motor and has a longer range compared to the R-77. It sports a AESA seeker and has conventional rear fins unlike the iconic lattice fins of the R-77. The K-77M and perhaps its ramjet powered cousin the K-77ME looks set to be the main medium range AAM for the PAK-FA. The K-74M2 is an improved version of the R-74 which is in turn a modernized version of the highly maneuverable, high off-boresight capable heat seeking R-73 WVRAAM ( NATO reporting name AA-11 Archer ). 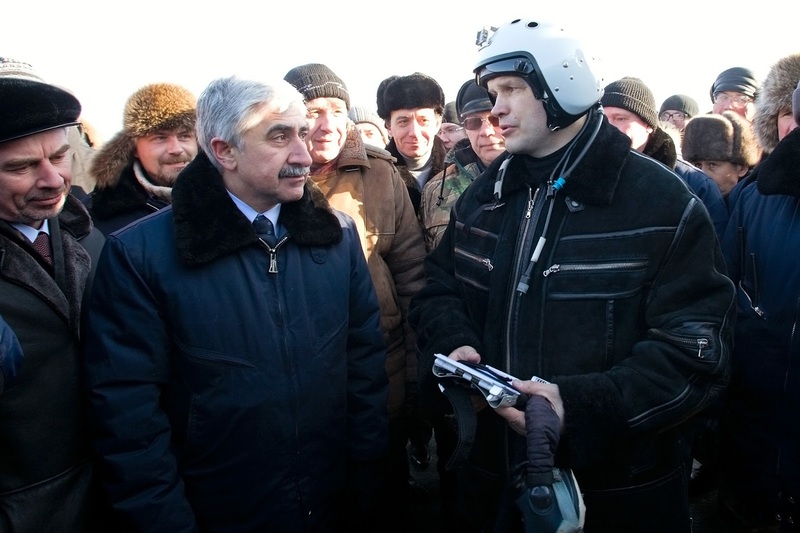 When used in conjunction with a helmet mounted cueing system, the R-73 is decidedly deadly. The K-74M2 with its fully digital and re-programmable systems can be expected to be even deadlier. It has a reduced cross section to allow for fitting into the internal weapon bays of the PAK-FA. The Izdeliye 810 is a very long range anti-ISR ( Intelligence, Surveillance and Reconnaissance ) AAM. Its targets includes AWACS, AEW/C, Elint, EW and other special purpose ISR platforms. There is no comparable missile of this class in the US/NATO arsenals. Another Russian VLRAAM, the Novator R-172 / K-172 / K-100 / RVV-L as it is variously known, has a range of 160nm ( 296km ) without booster and 215nm ( 398km ) with a booster pack. So it is probable that the Izdeliye 810 has a similar range. It is a huge missile but can still fit into the main weapon bay of the PAK-FA. The Kh-38ME family of air launch short range modular missiles can be configured with different payloads and guidance methods against a wide variety of surface targets including ships, armour, hardened and soft targets. The warhead may weigh up to 250kg, about half the total weight of the missile, and may be either High Explosive - Fragmentation, Penetrating or Cluster. Guidance modes can be inertial and either active radar ( Kh-38MAE ), satellite ( Kh-38MKE ), semi-active laser ( Kh-38MLE ) or thermal imaging ( Kh-38MTE ). Maximum range is said to be 40km. The Kh-38 multipurpose air to surface missile displayed at MAKS 2009. Source : Wikipaedia. The Kh-35UE is a modernized version of the Kh-35E tactical subsonic sea-skimming anti-ship guided missiles. Guidance is by inertial, satellite navigation, passive and active radar homing. 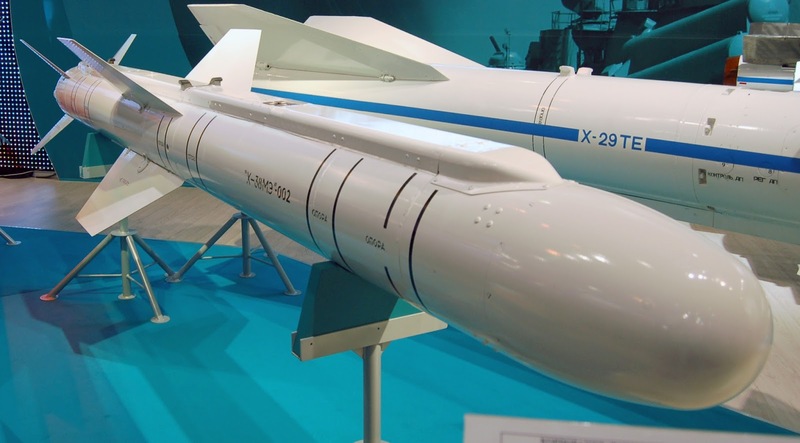 Maximum range is 260km, double that of the Kh-35E. The penetrating high explosive fragmentation warhead weighs 145kg and is designed against vessels up to 5000 tonnes. It can be launched in all weather conditions, up to a sea state of 5 to 6. The Kh-35U aka AS-20 Kayak air launched ASM has been nick named the Harpoonski. Seen here with folding fins at MAKS 2009. The Kh-58UShKE is the latest version of Russia's Kh-58 high-speed anti-radiation missile for use by the PAK-FA against ground based air defence radars operating in the frequency range between 1.2GHz and 11GHz ( L-Band to X-Band ). The missile is guided by a passive radar homing head and an autonomous control system. Maximum range is dependent on the aircraft's launch speed and altitude and can be as far as 245km. The missile's maximum flight speed is 4200km/h. It has a length of 4.19m and weighs 650kg. 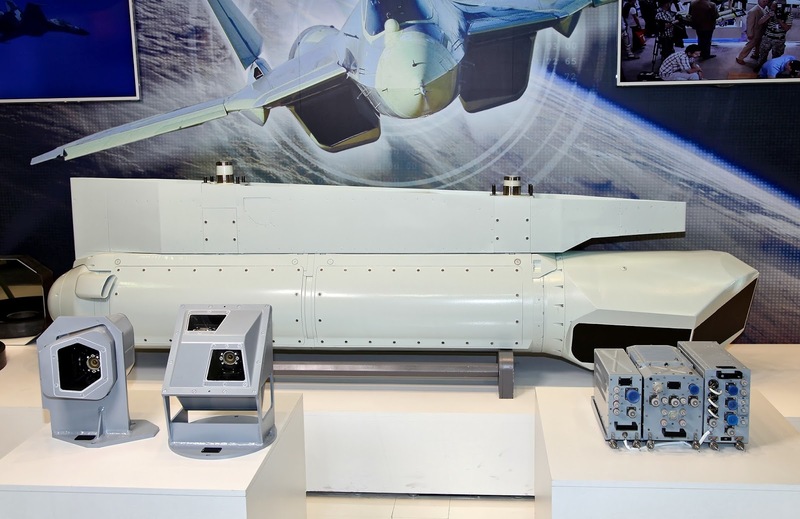 The latest version revealed at MAKS 2015 in August has an added Imaging Infra-Red ( IIR ) seeker. The thermal imaging channel enables the missile to strike radars operating in pulse mode and turning off when the missile is in its terminal phase, a tactic effective only against older anti-radar missiles. 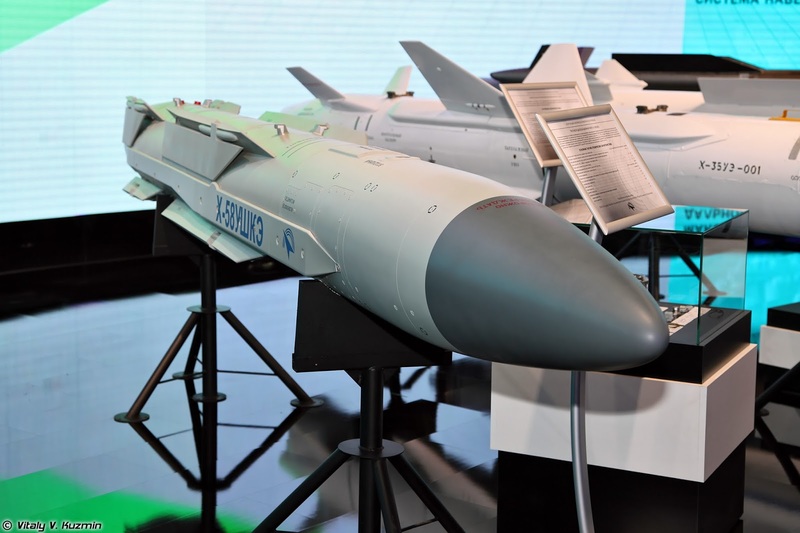 The Kh-58UShKE high-speed anti-radiation missile displayed at MAKS 2013. 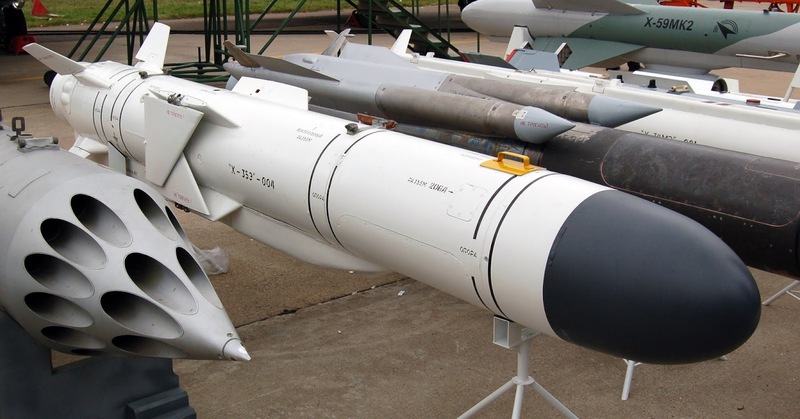 The KAB ( Korrektiruyeskaya Aviatsionnaya Bomba - literally corrected air bomb ) family of guided munitions is Russia's equivalent of America's Paveway series and JDAM smart bombs. They come in a variety of seeker and guidance packages and can be used against surface targets like buildings and installations, runways, moored ships, bridges, hardened structures etc. The 500kg class is the biggest that can fit into the weapon bays of the PAK-FA. The KAB-250 is a 550lb smart bomb similar in concept to the American GBU-39 small diameter bomb. As it is smaller and lighter than its bigger sibling the 1100lb KAB-500, more can be carried by a single aircraft and more targets can be attacked in a single sortie. T-50-054 Prototype carrying 2 x Kh-31 on inner wing pylon s and 2 x R77 on outer pylons. The Kh-31 is a family of medium range high speed air launched missiles that can be configured for use against different surface targets. They are ramjet powered. During launch, a solid fuel rocket booster accelerate the missile to Mach 1.8 before four air intakes open and the ramjet ignite. The original Kh-31A is an anti-ship missile with the NATO reporting name of AS-17 Krypton. At Mach 3.5 it was Russia's first supersonic air launched ASM. The KH-31AD is an extended range version of the Kh-31A. It has a maximum range of 160km when released at 15000m at Mach 1.5. At 715kg ( 1573lbs ) and 5.34m long, it is just a tad too heavy and too long to fit into the PAK-FA's internal bays. The Kh-31P is a medium range high speed anti-radiation missile for use against ground based and ship borne air defence radar systems. The Kh-31PD is an extended range version of the Kh-31P. It has a maximum range of 180 to 250km with launch parameters of 15000m and Mach 1.5. It has a inertial and wide-bandwidth range passive radar homing guidance. External dimensions are the same as the Kh-31AD. The BrahMos is a short range ( 290km ) ramjet powered supersonic cruise missile jointly developed by India and Russia. 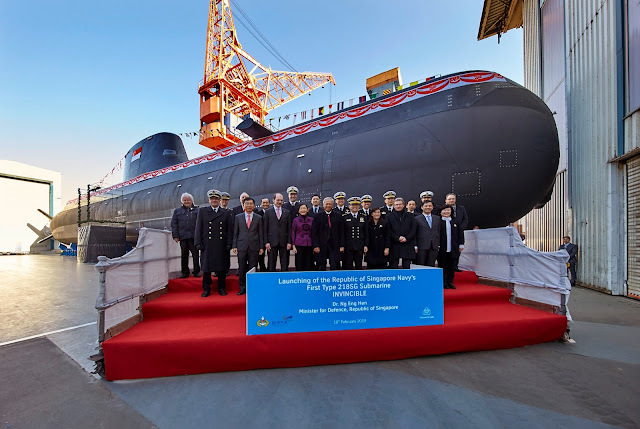 Named after the Brahmaputra and Moskva Rivers, it was a design based on Russia's P-800 / 3M55 / SS-N-26 Oniks cruise missile. Three main variants exists, air launched, submarine launched and surface launched. The original air launched version is the BrahMos-A which is 8.5m long and weighs 2500kg. A monster of a missile which the Su-30MKI could carry three at a time. At a speed of Mach 3.0, the BrahMos is said to be the world's fastest cruise missile. It can be used for ground attack or in an anti-ship role. A hypersonic version known as BrahMos II capable of Mach 7.0 is currently in development. A smaller and lighter version with a length of about 6m and weighing 1400 to 1600kg with a warhead of 300kg has also been developed. Initially known as the BrahMos-M ( M for mini ), it is now called the BrahMos-NG ( NG for next generation ). The Su-30MKI can ( barely ) carry a full load of five BrahMos-NG. The PAK-FA probably can manage at least four at the expense of everything else including range. Comparing the size of the BrahMos-A and the BrahMos-M. 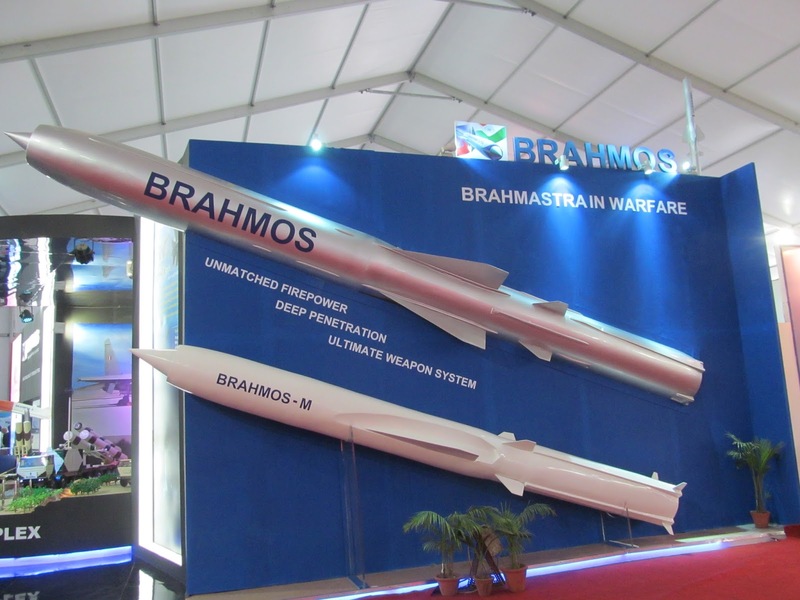 The mini-BrahMos is now known as the BrahMos-NG. Source : Wikipaedia. The KAB-1500 series of guided munitions is the 1500kg big brother to the KAB-500 and KAB-250. At 3300lbs they are simply too heavy for the internal weapon bays and so have to be carried externally in a non-stealth manner. The 9A1-4071K is a modernized version of the venerable GSh-30-1 30mm cannon with a rate of fire of 1500 rounds per minute. 150 rounds will be carried. The cannon is mounted internally. Guns are still relevant in this age of long range and ultra-long range missiles. It is not difficult to understand that combining a stealthy, aerodynamically advanced fighter design with state-of-the-art avionics and an array of advanced weaponry would create an extremely potent air platform. The PAK-FA seemed to have achieved all of the above attributes in a developmental timeframe ( 2001 - 2015 ) that is reasonable while costs are kept manageable, unlike Lockheed Martin's bloated, inflationary, under performing and many times delayed Joint Strike Fighter programme which started at around the same time. It would be interesting to compare the PAK-FA with the F-22 Raptor and the F-35 JSF since they are all 5th generation stealth fighters built to counter each other but that would itself justify a separate full article. 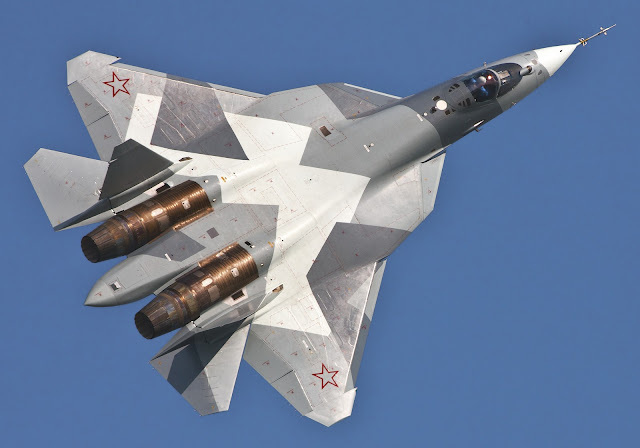 The PAK-FA surely deserves the accolade Ivan's Badass Stealth Fighter. Comparing the T-50, F-22 and the J-20. The chart is slightly outdated. 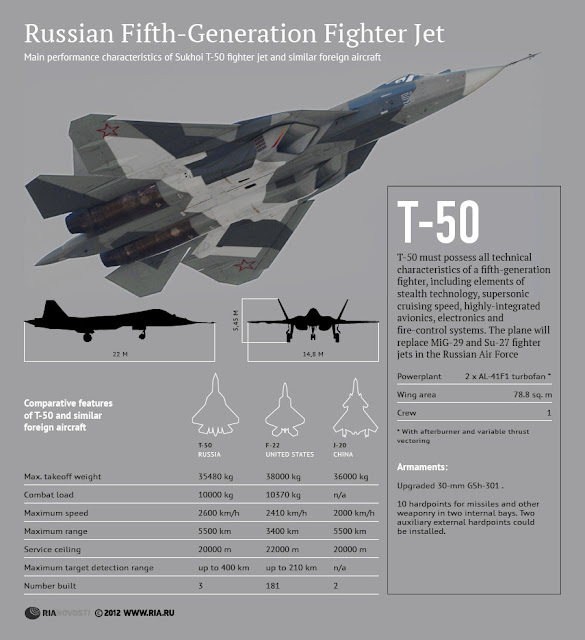 The initial projected production numbers for the Russian Air Force was 250 PAK-FA. The Indian Air Force wanted 214 FGFA. 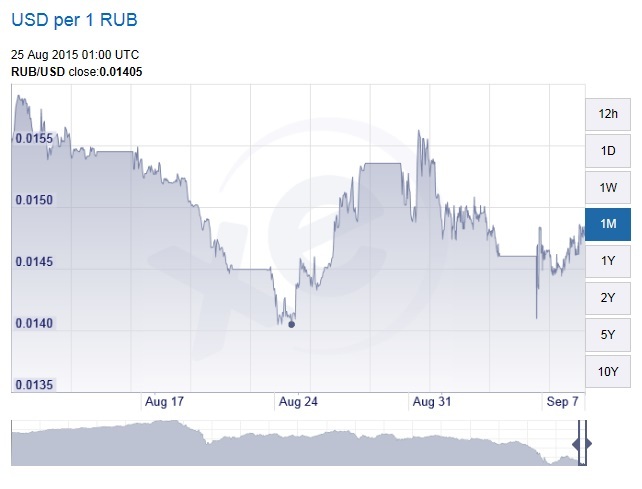 However, the trade sanctions against Russia brought about by the US and EU nations because of Russia's involvement in the Ukrainian Crisis and the fall in oil prices in the past 2 years have seriously affected the Russian economy. Export revenues slumped, jittery investors took 150 billion dollars out of the country, real wages tumbled and inflation is at a high of 16.9%. 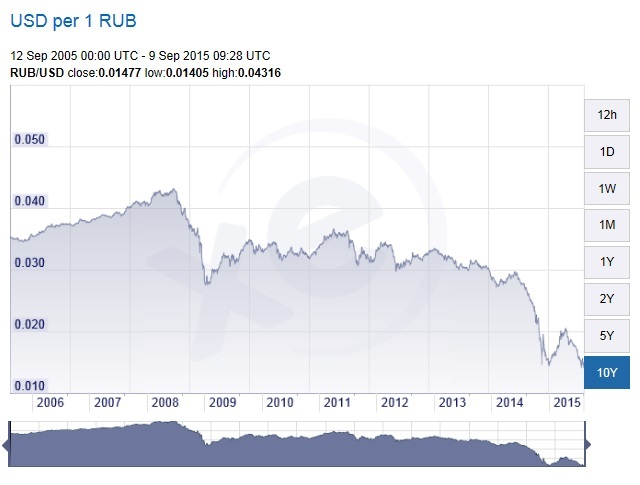 The reserves of the Central Bank of Russia decreased by 30 billion dollars this year alone and the Rouble also lost about half its value against the Dollar by Jan 2015 before recovering somewhat and then plunging again, reaching a 10 year low of RUB 0.01405 to the Dollar in late August. And now the IMF thinks the Russian economy will shrink by 4% in 2015. All this economic woes meant that Russia could no longer afford to buy that many PAK-FAs. The numbers were slashed drastically to 55 aircrafts, but as the economy continued its freefall even that reduced ambition seemed to be beyond reach. So finally, poor Pootin decided that he really could only cough out enough money for a dozen PAK-FA for now. Really? That's just a single squadron! USD per 1 RUB 1 month chart 10th Aug to 9th Sep 2015. The Indians it seems are also have some problems digesting 214 FGFAs. Budgetary issues dictate that they cannot have both the Rafele and the FGFA at the same time and they have reduced the aircraft numbers down to 144 instead. They are also unhappy with the unwillingness of the Russians to share key aspects of the designs with them and the general progress of the FGFA project. There were even talks of Indian officials being treated with disrespect by their Russian counterparts. The latest reports in Aug 2015 indicated that the IAF will further reduce its FGFA requirements to just 65 aircrafts to form three squadrons of 18 aircrafts each with the balance being used for training and evaluation. Future export prospects for the PAK-FA to other countries are also not looking too bright. Although the PAK-FA is cheaper to produce compared to the F-22 or F-35, it is still very expensive at USD 50 - 100 million a piece. Not many Russian-leaning countries can afford them in numbers that Joint Stock Company United Aircraft Corporation would like to see. The poor state of the Russian economy meant that Russia can no longer provide its allies with generous military aid like the Soviet Union did during the Cold War. 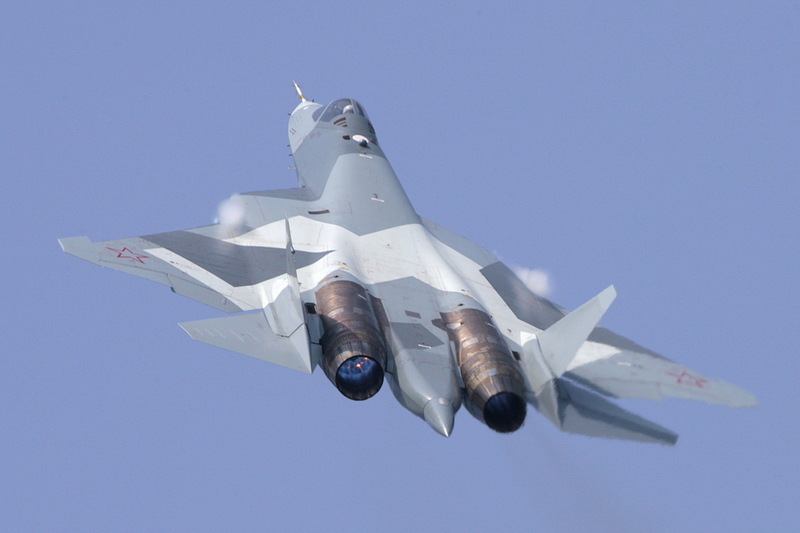 Whoever wants the PAK-FA jolly well pays the ongoing market rates out of their own pockets. Analysts think that in total, less than a thousand copies of the PAK-FA might eventually be produced for domestic and export, and even that might be an over optimistic estimate looking at current Russian and Indian numbers which totals 77. Gone are the glorious Soviet era of the MiG-21 Fishbed which sold 11496 airframes worldwide, not counting the Chinese imitations. Those good old days only exists in memory.